Ankara's operation against Kurdish military groups in Syria's Afrin has again exposed a rift between Turkey and the United States – two NATO members states and joint participants of a coalition against terrorism in the Arab country. Speaking to journalists on Tuesday, US Defense Secretary James Mattis claimed that Ankara's ongoing military campaign in the Kurdish enclave of Afrin, Syria, was hampering what he said was the fight against terrorism. "The violence in Afrin disrupts what was a relatively stable area in Syria and distracts from the international effort to defeat [Daesh]," Mattis said, speaking to reporters traveling with him in Indonesia during the secretary's ongoing tour of Asia. Ankara kicked off its operation against Kurdish military formations in Afrin, northwest Syria, code-named by the Turkish military as 'Operation Olive Branch', on January 20. The campaign, believed to involve some 6,400 Turkish troops along with thousands of Turkish-backed Free Syrian Army (FSA) militia, has resulted in dozens of air and artillery strikes against positions of Kurdish-led Syrian Democratic Forces (SDF). Ankara stated that its operation seeks to ensure the security of its borders and "is targeting only terrorists", according to Foreign Minister Mevlut Cavusoglu. The Turkish side said it had informed Damascus and Moscow, its co-guarantor in the Syrian peace process, of its operation, and has taken into account the position of Tehran, the third guarantor state. 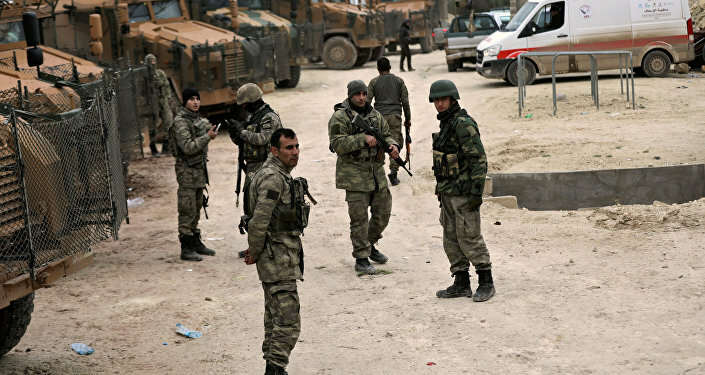 Turkish and Syrian Kurdish officials and media have provided competing claims over the state of the operation so far, although at least two Turkish soldiers, and several dozen FSA and SDF troops have been killed, according to various reports. The new operation has split the international community. Moscow said that it maintains communications with both Ankara and Damascus on the matter, and has emphasized that it sees preserving Syria's territorial integrity to be of fundamental importance. Syrian officials condemned the operation, characterizing it as an assault on Syria's sovereignty. London said Turkey had 'legitimate security concerns', but have also indicated that they would like to see a halt to the violence. Iran said it hoped to see an immediate end to the operation in order "to prevent a deepening crisis" in the Syrian-Turkish border areas. Turkey and the United States, both members of the international coalition of over 60 countries against Daesh, have been at loggerheads over the issue of Syrian Kurds: Ankara considers Kurdish armed formations a threat to its statehood, while Washington has been actively assisting the latter in their fight against Daesh and provided them with arms, despite Turkey's objections. In November 2017, US President Donald Trump had pledged to cut off supplies of weapons to Syrian Kurds. However, Turkey continues to maintain that Washington is arming Kurdish fighters. 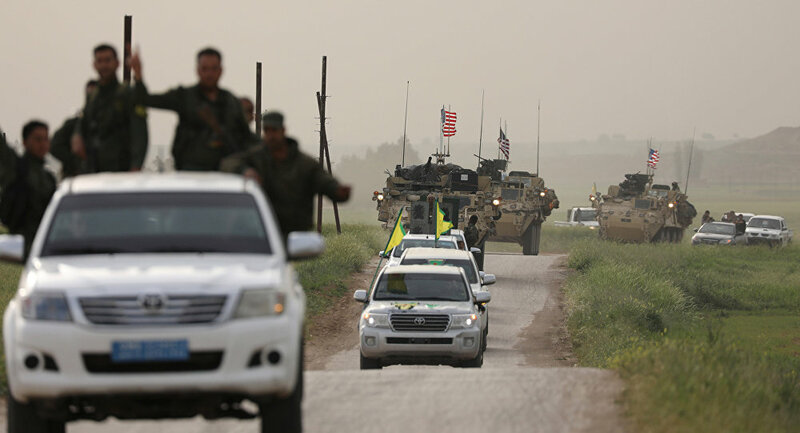 The rift deepened further recently after the US announced plans to build a 30,000-strong Kurdish-led Syrian Democratic Forces (SDF) security force on Syria's border with Turkey. The force was expected to consist to a great extent of People's Protection Units (YPG) militia, which Turkey classifies as a terrorist group affiliated with its own illegal Kurdish organization, the Kurdistan Workers' Party (PKK). The latter group, which calls for Turkish Kurds' autonomy from Ankara, is listed as a terrorist organization by both Ankara and Washington. However, the US draws a distinction between the PKK and Syrian Kurdish militias. The US plans immediately prompted an angry reaction from Ankara, with Turkish President Recep Tayyip Erdogan accusing Washington of forming a "terrorist army" and vowing to strangle it "before it is born." Washington has since backtracked on its plans. Relations between Turkey and the US took a plunge after the failed July 2016 Turkish coup attempt, which President Erdogan blamed on US-based preacher Fethullah Gulen. Washington's refusal to extradite Gulen has fueled Ankara's suspicions that the US was in on the plot.